Konoshima Shrine, known as Silkworm Shrine, has a small structure dedicated to the god of silkworms. As pure water was essential in the production of textiles, the spring here was considered sacred. People still believe that wetting their hands and feet in its water will protect them from illness. However, the main point of interest at the shrine, and it’s symbol, is an unusual “mihashira torii” gate – a triangular structure that appears to be formed from three individual torii – that stands in the pond. The historical records of Konoshima Shrine show that this mihashira was the first such triangular torii constructed in Japan. They state that, after a fire, a triangular torii was rebuilt at sometime between 1716-1736. The text hints at a reference to Nestorianism – the Christian distinction between Jesus’ human and divine natures – in the construction of the torii. It says that the three pillars represent the heavens, the earth, and mankind. This is not an interpretation common in Shinto beliefs. A private garden in Kyoto also has a mihashira torii standing in a stream. The Christian owners of the estate claim to be descended from a family of Christians who practiced their religion in secret during a time when Christianity was strictly regulated in Japan. 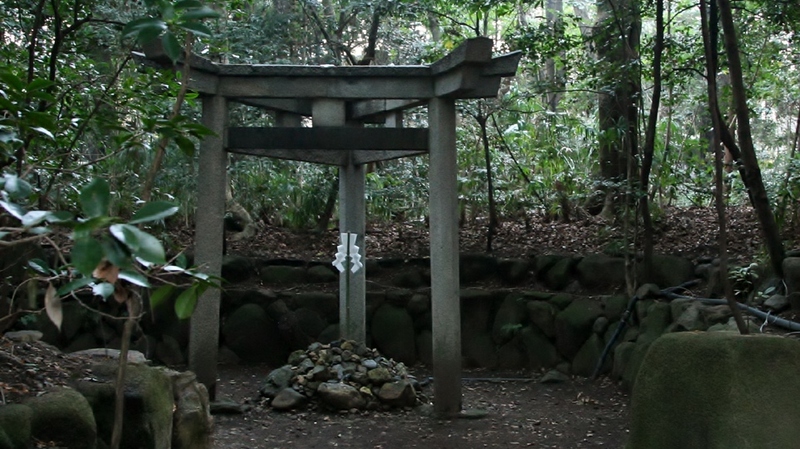 According to them, this type of torii represented the Holy Trinity and was used as a symbol for underground Christians. The shrine records also suggests that the torii symbolizes faith, hope, and charity. The Konoshima mihashira torii stands in a pond with a pile of stones in the middle of the structure. This supposedly represents the seat of a god, or perhaps God. Another three-sided torii is found in Tsushima, in Nagasaki prefecture, Kyushu. Christianity arrived in Kyushu, Japan with missionary Francis Xavier in 1549. There are striking similarities between the two gates: both were built at an unknown date and for an unknown reason; both have a pile of stones or rocks at their centre. Additionally, both are in watery settings – the one in Kyoto stands in a pond and that at Tsushima stands in seawater. What does a triangular torii-gate really represent? It remains a mystery! Access : 7 mins walk from JR Hanazono station on the JR Sagano line.